When Captain Robert Culver arrives at his next Air Force assignment, the NATO air base in Turkey, he was completely focused on his career. He is the oldest of three brothers who are all in the military. The Culver family has a long and storied service history. His father, William Culver, is a retired USAF General. The family knows that freedom is not free. That the few must sacrifice for the greater good of maintaining democracy in the U.S.A. Assigned to Incirlik Air Base, five miles east of Adana, Turkey, Robert is there as a coordinator within NATO and charged with working alongside his Turkish Air Force counterparts. He’s a Type A driven officer who is politically adroit, knows four foreign languages, including Turkish, and is the perfect choice as an American liason between the two friendly NATO countries for the duration of his three-year assignment. At 27 years old, Robert has no plans to marry, his career more important at this stage of his military life as a combat jet pilot, than settling down. When a poised young woman named Dilara Badem gives a talk to the NATO officers in Istanbul, Turkey about her family’s global charities, Delos, he can’t tear his gaze away from her. She is 21, cosmopolitan, accomplished and speaks five languages. It is her aquamarine eyes and that long red hair of hers, that rivets Robert’s attention. Later, at a cocktail party before dinner, her humor and compassion utterly win him over. He will spend the next year flying between Incirlik whenever he can get off duty and to Kusadasi, Turkey, where this breathtaking creature who has stolen his heart, lives. A year later, he asks Dilara to marry him and she agrees. So begins the Culver family saga. Robert had no vision of who the woman was that he would someday marry because his focus was on his military career. It is only later that he finds out that Dilara is the daughter of Artemis Shipping Lines, the largest container company in the world. Further, her family is worth ninety billion dollars. She is mostly Turkish with a dollop of Greek thrown in for good measure. He marries her for love, not for her family holdings, power or money. So begins my next family saga. Times have changed markedly since 1990 when I created the first three-consecutive series book series: Love and Glory. It introduced Laura and Morgan Trayhern of Morgan’s Mercenaries, to the world. My first family saga turned out to be 45 books long. The last of book in this world famous saga-series was BEYOND VALOR, HRS, February, 2013. Fittingly, it won the RT Book Reviews 2013 Reviewer’s Choice award for best Harlequin Romantic Suspense. What a way to end a memorable series! I’ve spent five years creating the Delos family saga-series. Times have changed and so my new series will mirror the chaotic contemporary world of today. You will meet the three adult children of Robert and Dilara Culver: Tal, Matt and Alexa. They are a military family because their father ingrained in them that duty to one’s country, was a must. The first four books, released as paperback (CreateSpace/Amazon) and ebook, will come out a month a part from one another. Since I’m an Indie author now and own Blue Turtle Publishing, I can push up the dates of publication of my books. I’m sure this will please my readers who hated waiting six month to a year (or more) for the next book I wrote to be released by my publisher. Not any more! Those days are gone! Aysun Badem, Dilara’s mother, had a vision and created Delos charities in 1950. Living in Kusadasi, Turkey, she ran the charities until she retired in 1990. Her daughter, Dilara Badem-Culver, then stepped in to pick up the reins of running the day-to-day demands and responsibilities of the family’s global charities. Dilara moves the headquarters from Turkey to Alexandria, Virginia because her husband Robert is assigned to the Pentagon. Her family annually pours a billion dollars into Delos. To a person, her parents, aunts and uncles passionately believe that those who have much, must give back much to those who have so little. Delos is composed of 1800 charities on five continents. There are storm clouds on the horizon for all NGO’s as terrorism raises its head and spreads like a virulent cancer throughout many countries around the world. Volunteers and employees of any charity, once welcomed by every second or third world country, were now being kidnapped, held for ransom, tortured, murdered, and their building torched and destroyed. Many NGO charities were driven out of desperately needy countries by these local, regional and global terrorists organizations. Delos did not escape being attacked, either. In response to the attack, General Robert Culver and his wife, Dilara, create an in-house firm: Artemis Security. Their three grown children, Tal, Matt and Alexa, would now be at the helm after leaving their respective military careers to run it. New books will be developed out of these missions created within Artemis Security who will vigorously defend their employees who work for Delos. The ex-military black ops trained employees are security contractors who will be sent out singly or as a team, to help a threatened Delos charity volunteer or their employees in any given country. Good news for my readers! There is a permafree ebook that kicks off this new series! LAST CHANCE is about Lia Cassidy, heroine and an employee of Delos charities. 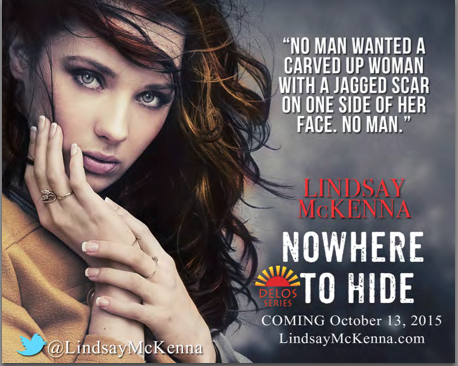 This is the prologue to her Book 1, NOWHERE TO HIDE. The free novella is a fourteen thousand words long and will set up the premise of the saga-series for the reader. 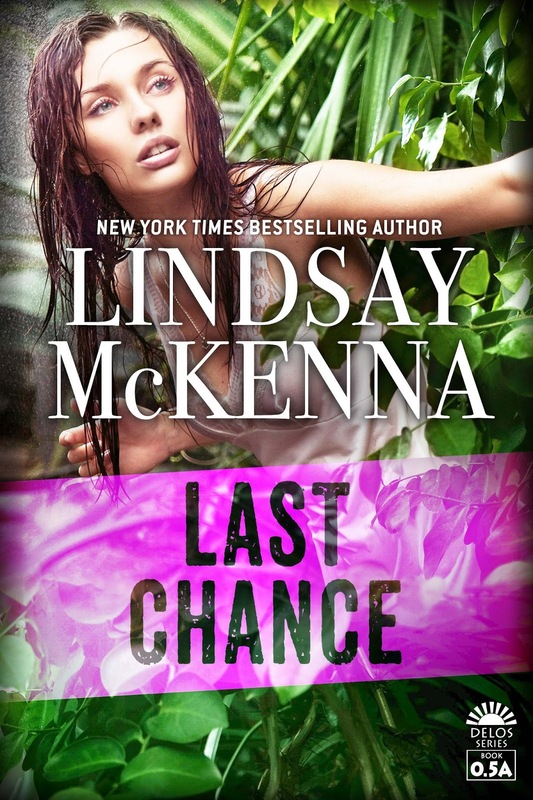 LAST CHANCE is available on all five major ebook platforms. Unfortunately, it’s not in paperback. 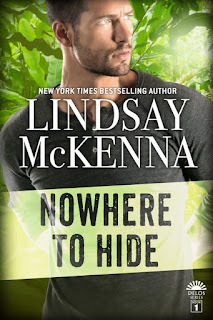 But my paperback readers can drop over to my website, www.lindsaymckenna.com, and be able to download a free PDF copy of this novella directly onto any device you currently own (any cell phone, tablet, iPad, Desktop or laptop computer), so you won’t be left out! And it will be easy to get a copy of LAST CHANCE dropped into your favorite electronic device. You don’t need to be a geek in order to download it, either. It will be be available everywhere for a free download on 7.13.2015. Lia Cassidy, the heroine of LAST CHANCE, has hidden from the world since experiencing a life-changing trauma five years earlier. At 25, she’s devoted her life to the Home School Foundation of Delos in La Fortuna, Costa Rica. Because she loves children so much, it salves her broken spirit and has helped her begin to heal. Little does she realize that one act of humanity by the teachers from the Delos school will set off a horrific event. Lia is caught up in the life-and-death drama , trying to survive it in order to warn Robert and Dilara Culver that their school was just attacked. This violent event will forever change how Delos charities operate the world over. Book 4, BROKEN DREAMS (Alexa Culver and Gage Hunter’s book), 1.2.2016. These books are 100,000 words each, and have a satisfying, happily-ever-after ending. These books set the stage for what you can come to expect in future offerings in the Delos series. There will be five to six books a year, a mix of big books along with novellas (40,000 words each). They will be books filled with gritty, high octane romantic suspense and intense emotional love stories that I’m famous for writing. On 2016, Delos stories will introduce more independent, feisty heroines who challenge headstrong, ex-military alpha male heroes on their specific missions. For the schedule of my book releases, titles, and their publishing dates, just visit the Delos section of my website so you don’t miss any of them! Even better? On the front cover of each book, down in the lower right hand corner, is the Delos logo with a number below it. This number indicates to the reader what book it is in this ongoing saga-series and it will guide you to know which book to read next. You can always check it out at the Delos section on my website, as well. Thank you so much for hosting Lindsay today! This series sounds quite and it's certainly timely. I am reading this now and already having a hard time putting it down to do anything else.